How could you not love this? It's bacon! Do you love bacon? I mean, do you REALLY love bacon? If so, the manufacturers of baconaisse and bacon salt have just the product for you. Ready for it? It’s a bacon coffin. Really? Yes! Let’s face it – those of us who can’t get enough bacon are going to need one of these sooner rather than later. You might as well continue to demonstrate your love of bacon for all eternity by being buried in a bacon coffin, right? This coffin – a true bargain at $2999.99 – is not only painted to look like bacon, but it also comes with a bacon sachet to keep your corpse smelling bacon-y delicious. Much better than that rotting flower smell of your average corpse, don’t you think? In case you’re worried about how the cemetery plans to keep dogs from digging you up for a bacon and bones breakfast, you don’t have to lose any sleep. The casket will safely hold your remains just as well as any other steel casket manufactured today. So if you want to express your love for bacon, nothing truly says love better than a bacon coffin. I say, go for it! It is a well-known fact that I become highly attached to my canine companions. My husband jokes that I don’t love him as much as I love my dog, which of course is…um…absolutely…um…not true. Anyway, my heart positively melted when I read about a woman in the U.K. who used the money she had saved for her wedding to pay for expensive medical treatment to save her pet. 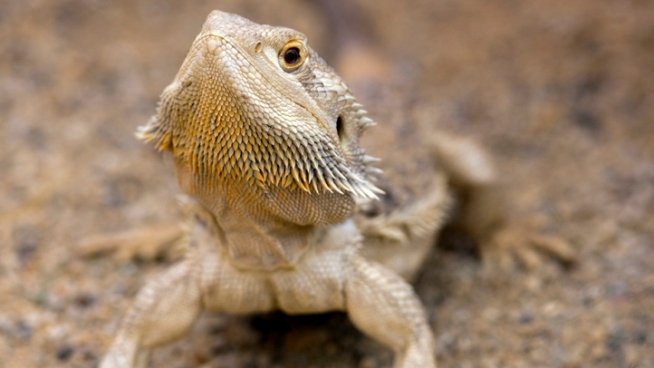 George, a bearded dragon, had a cancerous tumor on his head, and he needed chemotherapy immediately. Without thinking twice, she handed over her wedding fund to the veterinarian and kept vigil by George’s side. The lizard, thank goodness, is now in remission. As for her fiancé, he is definitely a keeper. When asked about how he felt about the wedding taking a backseat to George’s health, he said, “They definitely have a special bond. I understand he is her number one.” Now that’s the kind of man a girl could spend the rest of her life with. Just ask me. Ah hah! Now I get the whole Star Wars "FORCE" thing. It just had to be translated into a language I understand. I am a fan of private charities. I like the idea that people have a place to go to do things that matter to help those who need it. My teachers’ sorority, Alpha Delta Kappa, has made and served meals at our local Ronald McDonald house, donated shampoo and other needed items to a children’s shelter, provided school supplies to underprivileged students, volunteered time at a nursing home, and collected donations and walked in the annual Heart Walk for the American Heart Association. We are passionate about helping those in need, and private charities that provide important services need our help. That said, New York City has just banned the donation of food items to homeless shelters. All homeless shelters, public and private. This means that homeless shelters can no longer accept food donations from restaurants, grocery stores, and altruistic organizations. Food that is needed by the homeless will now be thrown away instead of donated. Of course there’s an excellent reason for this government interference with private charities. Apparently, the homeless in NYC are fat. Mayor Bloomberg wants to make sure that the homeless are eating nutritionally balanced meals, low in fat and sodium and high in fiber and nutrients. The only way the city can be sure that the homeless are eating properly is for shelters to serve only those food items with detailed labels. Menus can then be planned. This is very similar to how public school cafeterias are run. If NYC wants to operate its taxpayer-paid homeless shelters this way, that’s fine with me. The public shelters will be more expensive to operate, but I’m sure the taxpayers of NYC don’t mind the additional expense since they elected Mayor Bloomberg, and I don’t live there anyway. However, what about the private charities that run shelters? The shelters operated by religious and secular organizations are necessary, since there are not enough public shelters available for all of the homeless in NYC. Does Mayor Bloomberg really think that hindering these private charities is beneficial to the homeless? If these charities close down because they can’t accept donated food, where does that leave the homeless? Homeless AND hungry. I wonder when the government is going to start telling the rest of us what we can and cannot eat. I would suspect it’s only as far away as the implementation of Obama-care. Since the diet is part of overall health, it will, by default, become the government’s concern. Think the government has taken away too many individual rights already? Just wait. Thanks to guest-writer Chris Scullion for today's blog!! One of my favorite comic page characters once said "verbing weirds language." How right he was. But lately I've come to the conclusion that nothing "weirds" language like business. "Verbing" is rampant in corporate conference rooms around the country. People and departments are often "tasked" with certain activities. But corporate America wasn't satisfied with just "verbing." That's so 2002. Now they also "noun" words. The irony that "noun" is "verbed" above is not lost on me. Recently, in a project meeting with the higher-up muckety-mucks, the subject was an unforeseen project problem caused by the customer. The problem was going to cost time and money. "So, what's the ask?" said the VP of Sales. Everyone seemed to know that this was shorthand for "What are we going to ask of the customer? More time or more money or both?" I don't think there are enough synergies or market adjacencies in the world that could have kept me from laughing out loud. I credit my mother with teaching me how to write. I’m not talking about the part where she taught me the alphabet and showed me how to scrawl my name in big letters on lined paper, although she did that. I’m not talking about the encouragement and praise she gave when I came home with that 3rd grade story about fairies and castles, even though she did that, too. No, she taught me so much more about writing than that. You see, she taught me how to write…thank you notes. Thank you notes are an art form. A good thank you note has style, class, and legible handwriting. A good thank you note thanks the recipient for something specific, makes a personal remark about the gift, expresses sincere appreciation, and makes the recipient feel wonderful. Yup, well-written thank you notes are things of beauty. As a child, writing thank you notes was not an activity I would choose over watching TV or riding my bike outside. My mother “persuaded” me that I really wanted to write thank you notes by holding on to whatever gift I had been given, and by refusing to allow me to wear/spend/play with my gift until my thank you note was written, approved, shoved into an envelope, properly addressed, and stamped. Only then was the gift truly mine. Sometimes, I would sit and stare at that blank piece of stationary for a long while. Believe it or not, it is possible to get writer’s block even when writing something as “simple” as a thank you note. For example, what could I say when my aunt sent me a record (that’s a vinyl CD, kids) of Frank Sinatra’s Greatest Hits during my head-banging punk rock stage? “Jeez, Aunt Chris, who the heck is this old dude and do you really call that stuff music? What were you thinking?” just wouldn’t pass Mom’s eagle eye. Of course, it wasn’t until I was older that I came to the realization that I wasn’t really thanking the recipients for something; I was thanking them for their expression of caring. I was acknowledging that the thought behind the gift was important to me. I finally “got” thank you notes. Thank you so much for the birthday presents. I love the earrings and the movies. I can’t wait to watch Maggie Smith. I’ll pass along recipes from the magazines. I’m looking forward to receiving them every month. Thank you again. I love you, Mom. Now that's how it's done, people. The quintessential thank you note! An hour after she opened her presents, her thank you note was delivered directly to me – as a text message on my phone! Think thank you notes are outdated and passé? Are courtesy and appreciation outdated and passé? No way! So limber up those thumbs and text those thank you notes you've put off writing. Mom approves. I am saddened by a news report from China about two 5th grade girls who committed suicide because they thought that they could travel back in time after death. As someone who has often wished to travel back in time to meet Charlotte Bronte, Shakespeare, and George Washington, for example, I understand the urge to somehow make the impossible possible. The Chinese government blames the deaths on popular television shows that are about time travelers. Unlike the majority of fictional shows about time travel in the U.S. and Britain, the Chinese shows frequently have characters who must die in order to be able to achieve time travel. In the U.S., there is usually a time machine or a magic object that transports the living character to another time. Shows such as Quantum Leap, My Favorite Martian, and Dr. Who have been extremely popular and do not mislead viewers into thinking they can travel in time like the characters. I wish I had the comfort of believing that these two young girls are actually traveling about in time, living out their fantasies. Unfortunately, there is no evidence that this is so. Dead is dead, and all I really know for sure is that these girls will never grow up to be mothers, business women, authors, or doctors. It's a shame that their parents and teachers weren't aware of the girls' plan until it was too late. Heartrending story. I’m sorry, but I find the news story about Olivia Neubauer more horrifying than uplifting. This poor woman, who turned 100 years old on March 11th, is still gainfully employed as a teacher. Every school day since 1935, Ms. Neubauer has gotten up and headed off to school, where she has taught students ranging in age from preschool to high school. Her current job at Ashburn Lutheran School in Chicago is teaching reading to kindergartners. I love teaching, but I know I’d like to retire well before I reach 100. I want to travel, get my doctorate, learn how to ballroom dance, and have time to read. I don’t want to still be grading English papers when I’m in my 90’s. In my considered opinion, students aren’t going to be able to identify comma splices and misplaced modifiers any better in the next 50 years than they can today. Being forced to grade English essays for 65 years straight must be one of Dante’s lesser-known levels of hell, don’t you think? I admire Ms. Neubauer greatly. She must be an awesome lady, and I would like to meet her. I bet she has some fascinating stories to tell. However, I don’t intend to follow in her venerable footsteps. Retirement sounds good to me. Recently, I wrote a blog questioning – but not disparaging – Britain’s choice of Engelbert Humperdink as its representative in the 57th annual Eurovision Song Contest. Today, we have the opportunity to preview Russia’s candidate, the Buranovo Grannies (aka the Singing Babushkas). I looked up the rules, and as far as I can tell, one musical representative from each European country (13 countries have announced that they will participate so far) competes live on the European Broadcasting Union’s annual show. The winners are chosen by fans calling in their votes via the telephone. (Now we know where American Idol got the idea.) OK, I get that part. What I don’t understand is why these particular acts were selected for the music contest. It’s not that I don’t love Engelbert Humperdink or the Buranovo Grannies, because you can’t help loving them, right? But is one of these two contestants really expected to win? I am now intrigued by this contest, and I am also in luck. The program will be webcast when it airs live in May. I plan to leave my American music bias at the door, and simply enjoy the spectacle. It promises to be fun for all. Tilda Tiger had many hungry children to feed on Thanksgiving Day. She caught 169 Africans, 526 Americans and 196 Indians. She then put the people equally into 9 enormous ovens to bake. How many desperate people were in each oven? Nice, huh? A 3rd grade teacher in Washington, D.C. gave this math problem and 19 others like it to her class last week for homework. What was she thinking? You’re right, of course. She wasn’t thinking. She said that she was required to hand out the math worksheet, and that she simply did as she was told. True? Not so, says her boss. The school would never sanction such violent and inappropriate materials. The school promotes character and achievement, not Nazi death ovens and insane aliens. Whateva…. In my opinion, the teacher and the school must share the blame for this deplorable lapse in judgment. 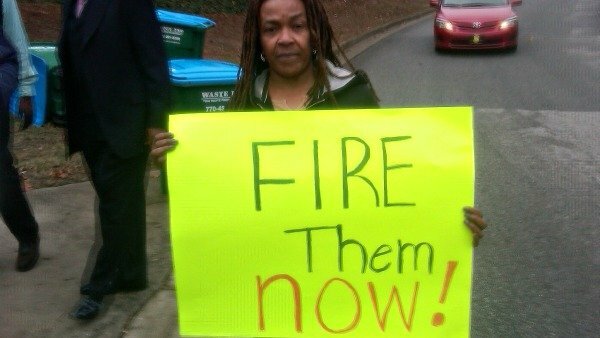 The teacher is obviously unfit to teach elementary school; the school hired her and allowed her to teach without the expert supervision she so obviously needed. Both must be held accountable. It annoys me no end to hear about things like this on the news. There are a lot of good educators in our public schools today, but it’s the stupid ones who get the publicity. We need to make a concerted effort to hire the top 10% of graduating college students instead of the bottom 10%. We have got to stop hiring the stupid! I wrote this article several years ago for an "Oreo Moments" contest. I took second place. (The winner was a picture of a baby with Oreos smeared all over his face. Go figure.) I thought it would be nice to run it here to commemorate the 100th anniversary of the Oreo cookie. I hope you enjoy it. Oreo cookies have long been my personal vice. When I was a child, I loved Oreos because they were, and still are, divinely delicious. They also held a special place in my heart because my grandfather worked for Nabisco and eating Oreos made me feel close to him. Although I knew that he was the vice president in charge of marketing, I preferred to believe that he baked each and every chocolaty, crunchy, delectable cookie all by himself. My friends were much more impressed that I had an Oreo cookie baker for a grandfather than they would have been if I had told them the truth. I mean, how exciting is marketing? Now that I’ve grown up, I find that I still have a soft spot for the chocolate cookie with the creamy white center. In fact, Oreos have become extra special to me because of the role they played on one very important day in my life. My husband and I had been blissfully married for 3 months when a friend of mine asked me if I knew of a good home for her puppy. Diane and her husband were in the middle of a bitter divorce and both were moving into apartments and could not keep the dog. I felt badly that her marriage was ending. Quite frankly, I couldn’t even imagine my new marriage ending. At 3 months, the golden glow of marital togetherness hadn’t yet dulled. I was in love, and I could only pity anyone not as happy. Chris and I both loved dogs, but neither of us had ever had one; his brother had asthma and my parents traveled a lot. In what may have been the easiest decision either of us ever made, we decided that we would be a good home for her puppy. So our family grew by one. I had arranged to go to Diane’s home to pick up the dog on a Friday afternoon in October. Before leaving work at 5 PM and 0 seconds, I dashed to the vending machine, dropped 3 quarters in the slot and punched E7. Out dropped a snack pack of Oreos. Dinner! I placed my cookies on the car seat next to me and drove off, excited to meet our new puppy. Molly was black and white, just like an Oreo cookie. She took one look at me and dashed in the opposite direction. I took one look at her and offered her my heart on a silver platter. She didn’t want it. An hour later, Molly's personal belongings – her bed, food, snacks, and blanket – were in the trunk of my car and Molly herself was seated next to me. She still didn't seem to think a whole lot of me, and had pressed up against the passenger door as far from me as she could get. I decided to give her some time, so I opened my cookies, started the car, and headed for home. Ten minutes later, sitting in traffic that was moving just a bit slower than a crocodile in a snow storm, I noticed that Molly had scooted over and was cautiously sniffing me. I reached out to pet her, and she licked my fingers – fingers that still had Oreo crumbs clinging to them. I took another cookie from the pack and ate all but a tiny sliver that I fed to my new friend. Together, we demolished the rest of the cookies and began our life-long friendship. Chris took me to task for what he rather unfairly called "bribing the dog with Oreos." I think he was just jealous because she decided that I was her favorite person. Together, Molly and I (and Chris too) moved our residence four times, raised two children, adopted another dog and shared a lot of Oreo cookies in the thirteen years we were together. Molly died a few years ago; my grandfather passed away in February. I miss them both more than I can say. But all it takes is a single Oreo cookie to remind me that they are both still with me, living in my heart and in my wonderful memories of our times together. Engelbert Humperdink? Are you kidding? How far will the Brits go to win the 2012 Eurovision Song Contest? Apparently, they aren’t averse to time travelling back to 1972 to locate “the perfect British singer” to represent them at the contest. That’s pretty far! Engelbert Humperdink, fondly called “The Hump” in England (but not in the States, thank goodness! ), has been chosen to compete in the European music competition. Engelbert Humperdink is 75 years old and had his last top 20 hit Britain in 1972. It was “Release Me.” I remember the song well despite the fact that I was only 10-years-old at the time. It is a lovely ballad. Humperdink’s voice was very pleasant, and since he’s currently touring in Europe, I would assume that it still is. The question I have to ask is, of course, WHY Engelbert Humperdink? Are the Brits hoping that “The Hump’s” classic song and crooning voice will have the power “to soothe a savage breast, to soften rocks, or bend a knotted oak” (William Congreve, 1697)? You know, they might just have a point. There is something to be said for trotting out the classics once in a while. There’s a reason that the songs Humperdink sings have become classics; they’re enjoyable to hear and you can sing along with them when they’re played on the Oldies radio station. That’s nice. I’m sure that Engelbert Humperdink will represent the U.K. with distinction at the 2012 Eurovision Song Contest. Here’s a toast to keeping the classics alive! Labels: ballads, British singers, Engelbert Humperdink, Eurovision Song Contest, family, history, humor, singers, U.K.
One of the perks of being a teacher is having the opportunity to share students’ stupid test answers with other teachers over margaritas on Friday afternoons. 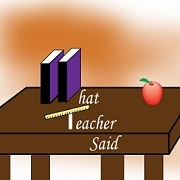 If students think we don’t laugh when we get ridiculous answers, they should think again…and perhaps again. Now, I regret that I didn’t take the time to jot down the multitude of ridiculous answers I received from my middle schoolers. I know they were pretty funny, but I can’t remember them. 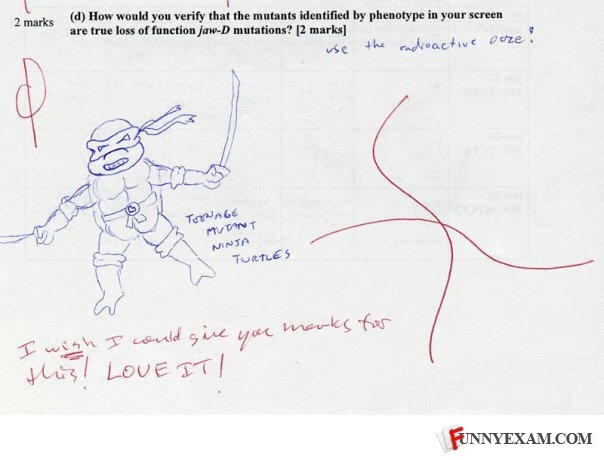 However, you can get an idea of what I mean by “stupid test answers” by checking out funnyexam.com. How can you get a 0 % on a multiple choice test? Statistically, if there are 4 possible answers, you have a 25% chance of choosing the correct answer even if you’re just guessing. If there are only 2 possible answers, you have a 50% chance of guessing the correct answer. However, what if you decide to do this on a true/false test? Star Wars quotes fit so many situations, don’t they? This answer would have received an A from me. And how about this answer for an upper-level genetics course question? I totally sympathize with this poor student, but he really should have studied for the exam. Ah, teaching has its benefits, does it not?